Berkeley, California: Flying Fish Press, 2017. Edition of 50. 9.25 x 12 x 3" house-shaped structure. Pullout drawer with artifacts and colophon. Written and illustrated by Lois Morrison. Ex-voto painting created by Elizabeth Collins. Printed letterpress on a variety of papers including paper made at Papeterie Saint-Armand.Book and artifacts made and assembled at Flying Fish Press. Text in English and Spanish. Numbered. Book artists Julie Chen and Lois Morrison have been friends for 40 years and have worked together on three artists' book collaborations including Ste. Ostrich in Manhattan: The Visitations of a Martyr (1990) and this most recent work — A Recuredo for Ste. Ostrich. A recuerdo is a memento, here a votive offering to a saint or divinity given in gratitude or devotion. In Mexico there is a long tradition of these offerings, giving thanks for a miracle or favor. This house-shaped votive recounts several stories about Ste. Ostrich. The outside tells and shows the intercession of the Sainte when a breakdown strands a mother and daughter in the desert. Inside are a series of connected stories recounting the ostrich's saga – her unappreciated gift of sand, unappreciated first at the birth of the baby Jesus, then by the sisters in a convent, then by the people of the Mexico. All this leads to her martyrdom and subsequent beatification. As in all of Morrison's religious work, this one has an element of quirkiness and dark humor. Though this seems to be looking through the glass darkly – only gift the ostrich has is rejected by all, the ostrich breaks her neck trying to bury her head at the bottom of a swimming pool -- ultimately the positive wins out. Even the seemingly most unworthy, even the lowly ostrich who "God hath deprived … of wisdom …[and] understanding" (Job 39: 13-17) is valuable and able to perform miracles. Is it a Memory ... or was it a Dream? Leonia, New Jersey: Lois Morrison, 2006/2010. Edition of 25. 9.25 x 7.5"; 26 pages. Dos-à-dos binding. Handcut and assembled. Bound with heavy cardstock and sewn Tyvek hinges. "Is it a Memory ... or was it a Dream?" by Bryan: Laser, ink-jet, letterpress, Gocco, and rubber-stamped images. Pull tabs, volvelle, pop-up. Colored pencil embellishments. "The Show of Dr. Mortvisage" by Morrison: Gocco printed images. Puffed out with heavier paper. Glued to a Gocco printed background. Typefaces: original, Big Top, Viking, Bard, Aardvark, and Vivienne. Papers: Strathmore and Crosse Pointe's Synergy. Morrison's doll series began with The Hollow Doll (out of print) in 1998. She has continued these doll-related stories of age and brokenness through several books including In the Land of Shadows and Mechanical Baby. Although Morrison does not state it directly, Mortvisage can be translated as the face of death. This translation ties in not only with the recurring bleakness of the doll series but also with her Day of the Dead references in other bookworks (like Une Nuit D'Hiver). In this work the last page contains a Day of the Dead skeleton figure. Tara Bryan approaches this dollscape from a different direction, although Morrison parallels appear throughout. Tara Bryan, colophon: "Lois Morrison's Gocco-printed images sent me onto a side track of broken dolls, which led to compiling sayings using body parts. There I stayed. Go figure." Leonia, New Jersey: Lois Morrison, 2009. Edition of 25. 7 x 11.75 x 2.75" shadow box with moveable parts. Text, images, and colophon printed in Agate Normal on hand-dyed Lenox 100 paper and a plastic wheel page. Box structure covered in Indigo paper by Cave Papers. Box structure includes frosted Mylar, wooden dowels, small carved wheels, and short ruler pieces. Box upper interior lined with a computer print of a NASA photograph. A painted metal skeleton from the La Gunilla flea market in Mexico City hangs from the top of the box interior. Box lower interior displays a plastic wheel that can be rotated from left side of box displaying images and text. Housed in a light blue and white letter fold case with button and thread closure. Case covered in Cloudy Sky paper by Cave Papers. "These words and drawings appear as the wheel is turned with one forefinger. The historical text is printed on the back of the box, while the formal description of the catacombs, a list of some of the people there, and the colophon are printed (again on a Gocco) on three sections of a wrap that secures the box." Colophon: "Rich man, poor man, beggar man, thief were all tumbled together. The famous Danton, Colbert, Robespierre, Lavoisier, Charles Perrault, Mansart, Rabelais, Lully, Racine, Marat, Pascal, Montesquieu and The Man in the Iron Mask. The Terror added to these Charlotte Corday, Louis XIV, and the rest of those who went to the guillotine. During both World Wars, the Partisans used these underground areas to avoid the enemy. This metal skeleton is 'no man.'" Leonia, New Jersey: Lois Morrison, 2005. Edition of 25. 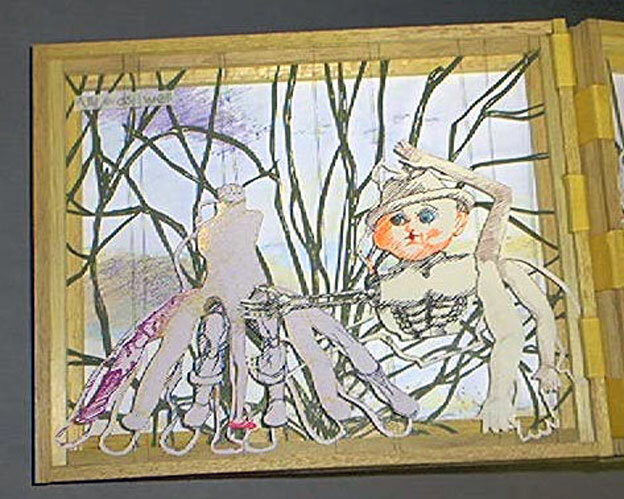 9 x 5.5" tunnel book with envelope fold attached to contain "paper doll" of Geryon. Color-copied from crayon drawings. Gocco-printed and color penciled onto digital color supreme glossy recycled Arches text wove and Fabriano Tiziano lava red. Typeface if Font Lister: Font Book #68. Handcut, grommetted and assembled. Wrapped in lined cloth with button closures. Embroidered runes on the cloth wrap. Text by Morrison on exterior accordion sides of the tunnel book. In Greek Mythology Hercules had to perform twelve Labors for penance of the murder of his wife and children. The tenth of these Labors was to steal the cattle of Geryon from an island called Erythia, which was near the boundary of Europe and Libya. In the execution of this theft Hercules kills Geryon and the two headed dog who guards them. Geryon is described has being red, incredibly strong with six arms and legs. While Geryon may not have been the most attractive fellow he was after all protecting his property. Few remember that in the execution of the Twelve Labors Hercules actually committed a series of crimes. At the beginning of the "Autobiography of Red," Anne Carson translates fragments of Stesichoros' "Geryoneis" that show Geryon as far more vulnerable and gives him a red dog that Hercules clubs to death. Stesichoros also gives Geryon a pair of wings and has Hercules split his skull with a single arrow. Thus, he dies protecting his mythical herd of red cattle from Hercules. Carson recasts the Geryon Labor as a contemporary homosexual love affair. In Morrison's representation two Geryons share the pocket on the back of the tunnel book along with a red dog. These 'paper' Geryons can be placed in the tunnel book among the cattle. As one manipulates the Geryons and "reads" the story of the Labor, Morrison charges the reader to "Believe what you will." Leonia, New Jersey: Lois Morrison, 2007. Edition of 32. 2.5 x 3.75"; 22 pages. Accordion with pop outs. Printed with a Gocco printer on Magani Pescia, Tyvek, and Crosse-Pointe's Synergy. Enhanced with a Pigma Micron pen. Typeface: Agate normal italics. Handcut, assembled, and bound. Photographs by Enrique Chavarria. Bound in illustrated paper over boards. Wraparound of 1 x 7" cloth band with thread and button closure. Lois Morrison: "The drawings are of a cedar tree and branch in B.L. Speck's pasture in Virginia. The doll bodies were found in La Gunilla in Mexico City. My copy lives in the torso." A continuation of the moody and allusive Doll Series, which began with The Hollow Dolls (1998) and After (1999). In this installment two battered and abandoned dolls, one a mere torso, meet "after it was all over." The travel together, around a fallen cedar, around a dead branch. The only difference in getting past the two obstacles is that one "took a long time and was prickly," the other was "shorter ." Somber colors, bare and tortured landscape, a journey impelled by nothing, not danger or curiosity or joy, marked by struggle and movement, movement on — an allegory of old age? Leonia, New Jersey: Lois Morrison, 2003-2004. Edition of 25. 8 x 10 x 5.75"; six-panel book to be folded in two directions with Japanese screen hinges. Section backgrounds color-copied. Green layered linoleum cuts, printed onto Tyvek. Figures Gocco-printed onto Cross Pointe's Synergy, text onto oriental paper. Figures float on .007 music wires. Typeface Kids. Cover hand-dyed ticking over board. Hand-cut and assembled. A book of four shadows: two physical - the actual shadow that light throws and the cut-out outline of each figure; two psychological- reflections of events, the shadow of what had happened earlier to cause them to be assembled so bizarrely and the arrival of the black menace that hangs in the sky over their heads. Leonia, New Jersey: Lois Morrison, 2000. Edition of 25. 6.25 x 4.5"; 8 spreads. Accordion fold Color xeros pop-outs. Gocco prints on Magnani Pescia paper; Amherst type. Color copied dolls laminated onto acid-free drawing paper. Color Gocco-printed cotton over board covers with ribbon ties. Hand cut and assembled. In this third installment in her saga of the dolls, and following her practice of using found objects as inspiration, Morrison continues to explore survival and aloneness in an oddly melancholic, yet hopeful tale. (I recall a line from Emily Dickinson: "After great pain, a formal feeling comes . . .") In this edition, the actual "baby" of the title is a rusty old toy that, wires exposed, is missing a head and is crouched in an eternal crawling position. 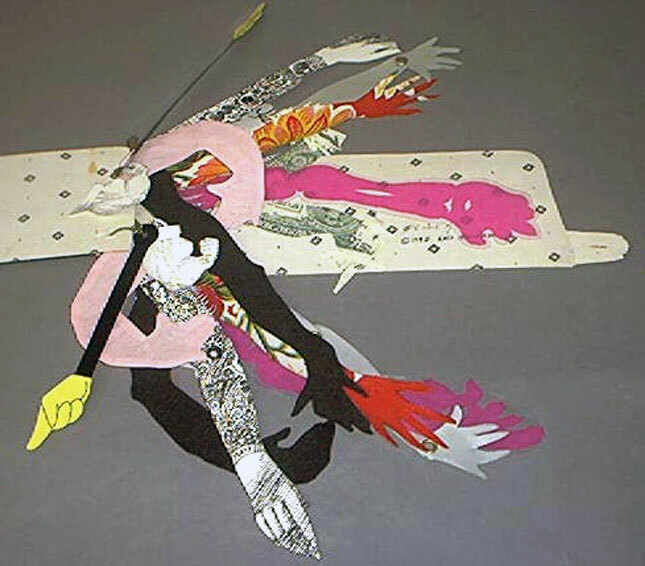 Color Xerox pop-outs of the doll, photographed from different vantage points, crawl across a black and white, Gocco-printed, accordion-fold landscape that was drawn from the terrain around the artist's summer residence. There is the suggestion of autonomy, the survival of the spirit, inherent in the series, which began with her titles, The Hollow Dolls (1998) and After (1999). The lonely, isolated determination of the mechanical baby is an emblem of will, which moves us forward in the face of despair despite the odds. The terrain could be the landscape of memory or loss, at once a shared and an individual experience. With spare text, the pages are haunting, dreamlike. The reader is drawn into an altered world, and perhaps touches an altered, contemplative state. Leonia, New Jersey: Lois Morrison, 1996. Edition of 25. 8.5 x 5.5"; four folds. Accordion fold. On Canson me Tientes and Masa papers. Hand cut and assembled. Thai Soft Unru paper over boards. Text, illustration, and binding by Lois Morrison. This accordion fold book tells the story of a gathering of broken dolls following a disaster. "After it was all over they gathered and found the world was as beautiful as ever," but they had been changed. In the middle two folds of the book, the dolls float above the long drawing of an herbaceous border. Color-copied background landscapes, photographs of broken dolls, and Gocco printed black and white missing doll parts. Biblical Related Work: Books by Lois Morrison with text and image based on a biblical passage. Leonia, New Jersey: Lois Morrison, 2000. Edition of 4. 7.5" x 9.3 x .85". Multiple images, transparent and other, are laminated between distressed plastic. Bound together by brass rings. The base and case are covered with bunting from a 4th of July celebration. A plastic mirror is laminated to the base. The case is lined with Lana Ingres and secured with beads and tape. The text, 1 Corinthians 13:12 King James Bible, is hand lettered on scratch-lite. 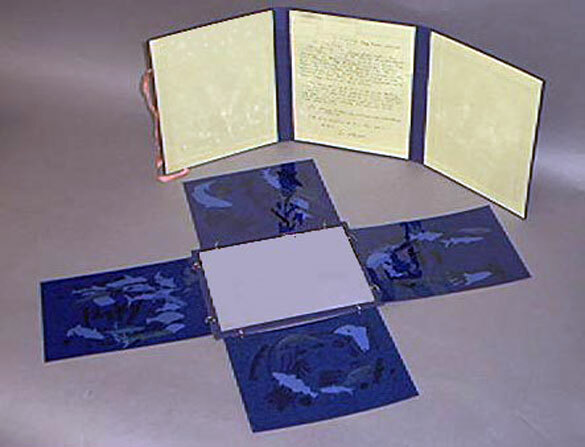 Four blue plastic pages with darkly seen images and text unfold one by one to reveal a mirror in which one sees "face-to-face." Leonia, New Jersey: Lois Morrison, 1993. Edition of 25. 5.25 x 3.25" A two part book, enclosed in single case with red cloth boards using a button and crewel clasp. Two accordion books laid-in folded green paper which is attached to the interior boards. One fold-out is the Biblical text from the King James version of the Bible with illustrations. 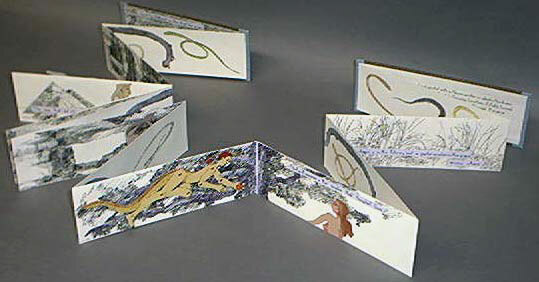 The second fold-out text "Later" is written by Lois Morrison who also illustrated, lettered, and bound this total production. Printed on Lenox 100 and Arches Text Wove with a Gocco Printer. Returned to with watercolor and ink. SIGNED by Morrison. A tunnel book tells the biblical story of the swine jumping off the cliff and drowning. An accordion-fold book tells what happens later as people begin breeding the Gadarene swine. The Natural Order of Things: Morrison observes and documents the creatures in our world from the crawly ones to those that soar in the sky. Leonia, New Jersey: Lois Morrison, 2015. Edition of 20 + 5 proofs. 4.75 x 6.25"; 5 double-page openings. Star carousel structure with 9" diameter. Printed with a Gocco printer on French's Lemon Drop, Banana Split and Shocking Yellow plus a light yellow paper. White paper is sponge painted on Arches Text-Wove. Animals Gocco printed on leftover paper scraps then enhanced with acrylics, colored pencils, and a Pigma micro pen. Typeface is Viking-Normal. Paper-covered stiff boards. Magnet closure for carousel opening. Tie closure for closed book. Signed and numbered by the artist. The idea for this book came from a presentation by the artist in which she discussed her creative process. 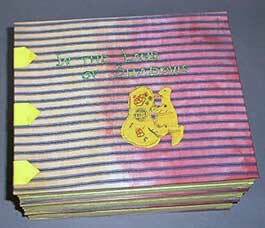 Morrison recommends using the Artist Book Ideation Cards developed by Julie Chen and Barbara Tetenbaum. As an example, using the cards, Morrison's color card directed her to use her " favorite color." Yellow became the defining theme for the resulting book. Most characters in Deep in the Yellow Woods are from other Morrison works, but she did introduction a new character — the yellow dog. The yellow goat, featured in previous works and one of her favorite characters, was inspired by an old comic strip "The Yellow Kid." Through the years the yellow goat has had many adventures and in this book he is dancing to the music of Pan's pipes in the yellow woods — along with elephants, Eve's snake, the great rabbit in the sky, and the yellow striped dog. Leonia, New Jersey: Lois Morrison, 2011. Edition of 25. 5.5 x 8.25"; 12 pages. Accordion structure. Handlettered text by the artist. Collage, cut outs, pop outs. Giraffes printed on interference-splattered frosted plastic. Other papers: Bristol Board, Masa, Mulberry, Strathmore 400, and Crown Point Synergy. A Gocco printer used for everything but the landscape, which was color-copied. Bound in illustrated cloth-covered boards. Laid in four-fold illustrated black cloth wrap with button and thread closure. Drawn, hand-cut, written, assembled and bound by the artist. Signed and numbered. Lois Morrison, colophon: "This book is based on a fortunate mis-reading of Temple Grandlin's writing about friendships between giraffes, among others, Aeolian. Aeolus is the god of winds so they must be the most delicately beautiful creatures on the African plains. Re-reading the passage, I realized the word was Angolan, but by then it was too late, the image had taken hold." Leonia, New Jersey: Lois Morrison, 2001. Edition of 25. 2.75”square; 5 spreads. . Gocco printed images are enhanced with Pigma pens and watercolor. Hand lettered text, decorated paper over board covers, tie closure. Hand cut and assembled. A miniature artist book about secretly carnivorous clouds. Morrison's ability to see the darker other side of events and objects is always balanced by her wit and the ever-delightful presentation of her books. Looking at clouds from both sides now (like the pop-music classic), Morrison observes that they may not necessarily be the benign shapes we project upon them to soothe ourselves, but rather, "changeling monsters, dropping softly to the ground, surrounding and muffling all cries with dense fog." This three-layer carousel accordion depicts a background landscape; pop-out clouds; and a thin band of poetic text in the foreground. The back side of the accordion is humorously decorated with text balloon quotes of fog-prompted shrieks A delight. Leonia, New Jersey: Lois Morrison, 2007. Edition of 25. 5.75 x 8.75"; 16 pages. Double-sided accordion. Printed with a Gocco printer on Bristol board, plastic, and marbleized paper. Corrected with pigma micron pens. Typeface is Garamond Italics. Bound with marbleized printed paper over board. Vintage ribbons hold the book together. Hand-cut and assembled. Granted, the world is too much with us, but how much of it do we notice? Morrison directs our attention to the insect world, part of our world, but to most invisible. Text: "When we see clothing show in natural settings, do we ever think, or are we even aware of the myriads of insects that share that setting? ..."
9.75 x 5". Purple green and yellow exterior with turkey skin? Printed by Gocco printer. Typeface is Ill Omen Pink paper for wrapping tacos. Cover is cloth over board with turkey feet fro Mexico City. Plastic Tyvek and Frasia'a passport paper. Some turkeys are laser printed, some by Gocco. Leonia, New Jersey: Lois Morrison, 2002. Edition of 25. Printed with a Gocco printer on oriental paper and gone back into with Pigma Micro pens and watercolors (beavers' teeth). Piano wires support the skulls and balsa strips support the wires. 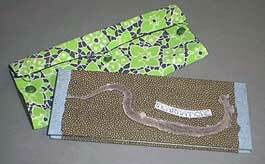 Covers are an African cloth over board held together with hand dyed rayon seam binding. Held by a bone clasp. A six paneled book with drawings of exposed tree roots and animal skulls found beside the road near Morrison's house in Virginia. A snapping turtle, a raccoon, and owl lore, etc. fill the front of the panels and the back of the panels have the description of the finds and the family finders. Leonia, New Jersey: Lois Morrison, 1998. Edition of 25. 10.5 x 3.25". Gocco printed on Fabriano Tiziano. Some crows are pasted to foam and glued down so they rise slightly away from the page, adding visual interest. Bound in green sharkskin paper over boards. And, then ... These books are ones with odd shaped pages which are laminated. Enclosed in a 2.75 x 2.75" simple, slotted paper case. Printed in black with a Gocco printer on street-salvaged amber-colored filter (celluloid) and laminated. Small grommets in each page allow the book to be worn as a necklace. Seventeen pieces strung on a black, braided cord with clasp. Text, illustrations, and binding by Lois Morrison. From the text: "In all the writing about insects trapped in amber rarely does anyone write about what it must have been like for the insects who were so caught." Morrison writes that "the imperfections of the filter's previous street life are much like those in real amber. The insects and bits thereof are drawn from what was on my cabin floor this spring." Leonia, New Jersey: Lois Morrison, 1993. Edition of 9. 7.25" x 7.75 x .25" Uses Garamond. Text and drawings printed on tissue paper with a Gocco printer. Laminated to tissue paper hands from a Mexican political banner. 18 laminated kite pages held together with one ring from which hangs crewel thread simulating a kite's tail. Housed in white pictorial cloth bag with button closure. Lois Morrison: "The little kites, flown from those flat roofs in Mexico City, hang tangled for months from the wires." What's He Got Up His Sleeve? Leonia, New Jersey: Lois Morrison, 1992. Edition of 8. Arms are gocco printed, sewn, cut, found. Arms in felt, fabrics, metals, papers, and plastic laminates. In box. Vintage cuffs form the covers of this book which is filled with baby arms, Popeye's muscled arms, skeleton arms and more in all sizes and colors. Morrison's wandering mind takes up the question of "What's He Got Up His Sleeve?" then proceeds to give several possibilities. Leonia, New Jersey: Lois Morrison, 2003. Edition of 25. Color copied and printed with a Gocco printer then returned to with Pigma Micron pens, colored pencil, water colors and Painters medium opaque paint marker. Type: Bard. Hand-cut, grommeted, assembled and bound. Snakeskin and Cave's blue jean paper over boards. 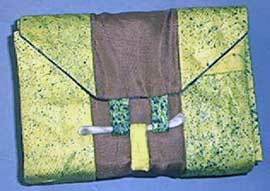 Enclosed in vintage feed sack material and clasped with three vintage buttons. Reviewing the possibilities of the life of the snake found flattened in the driveway – from Medusa's head to a garter-snake-in-the-grass.